If you are applying for a Dental Nurse vacancy then you may need to write a covering letter for your application. Here is an example job application cover letter of Dental Nurse. 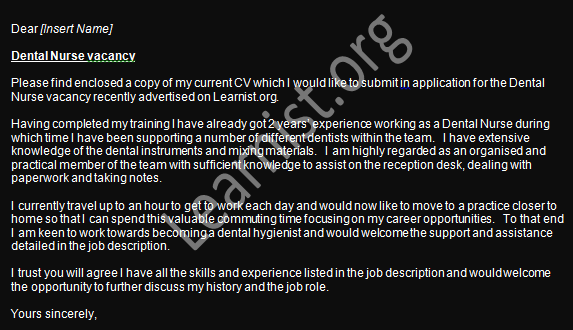 Please find enclosed a copy of my current CV which I would like to submit in application for the Dental Nurse vacancy recently advertised on Learnist.org. Having completed my training I have already got 2 years’ experience working as a Dental Nurse during which time I have been supporting a number of different dentists within the team. I have extensive knowledge of the dental instruments and mixing materials. I am highly regarded as an organised and practical member of the team with sufficient knowledge to assist on the reception desk, dealing with paperwork and taking notes. I currently travel up to an hour to get to work each day and would now like to move to a practice closer to home so that I can spend this valuable commuting time focusing on my career opportunities. To that end I am keen to work towards becoming a dental hygienist and would welcome the support and assistance detailed in the job description. I trust you will agree I have all the skills and experience listed in the job description and would welcome the opportunity to further discuss my history and the job role.